Topological Knitting: featuring the HRSFA Klein Bottle Hat! Apologies: this post has been very long in coming but I’ve finally gotten around to writing it up. I did a bunch of knitting last fall and winter, partly spurred on by the HRSFA yarn that the awesome hobbitknitter gave me last summer. (And general thanks to hobbitknitter for encouragement, yarn, loan of needles when I went in for jury duty, etc.) At the beginning of last fall it occurred to me that a Klein bottle would be a befittingly awesome thing to turn HRSFA yarn into. But before we get to that: my Mobius strip, which was sort of a warm-up project for the hat. The construction of this was a lot simpler topologically: I just knitted a tube with a slit in it, fed the narrow end of the tube through the slit, and joined it to the other end of the tube. The only tricky thing here was doing all the increases and decreases in k2p2 rib, which I think I managed fairly nicely. 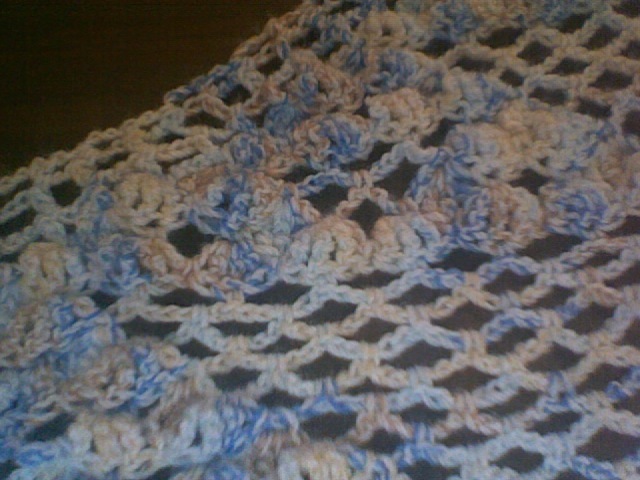 Ordinarily, crocheting in variegated yarn produces alternating patterns because the crocheting goes back and forth. 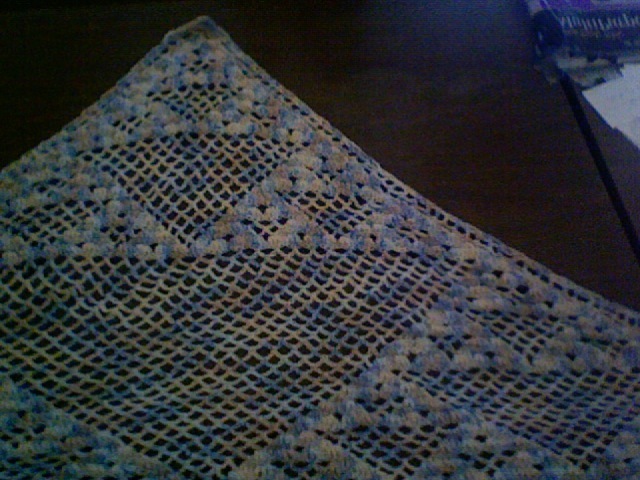 But when you do potholder stitch (see my earlier post) the situation is different. Each row only shows on one side, so all the rows on the same side go in the same direction. That means that a pattern will tend to be regular. My aunt got some yarn for me to make potholders, and it’s white yarn variegated with five rainbow colors (not blue or indigo). Each white or colored section takes about 6 inches, or 3 stitches. So my 30 stitches turned out to be nearly perfect to make the yarn go through exactly one cycle per side. I thought this would mean that the potholder would have boring nearly-vertical stripes, but it turns out that the dyeing of the yarn is not quite regular enough to permit that. It’s close, but it has zany variation! Take a look. If you look closely you can see how the hook is stuck through the back loop of one row and the abandoned front loop of the previous. It’s so zany–almost perfect striping! It comes out nearly the same way on the other side, too.